The Torpedo Factory Art Center invites emerging and experienced artists to apply for one, two, or three-month residencies between June 1 and August 31, 2011. The Torpedo Factory Art Center (www.torpedofactory.org) in Alexandria, Virginia is home to more than 140 visual artists working in 82 studios. Artists create in a wide variety of media including painting, fiber, jewelry, ceramics, printmaking, cast and stained glass, and sculpture. The Torpedo Factory is open to the public every day; visitors are invited and welcomed into studios to watch artists at work, ask questions, and purchase original art – allowing the public an opportunity to share in the excitement and fascination of the creative process. Finalists will be selected by yours truly. There is no application fee. The Washington Project for the Arts (WPA), the mid-Atlantic's premier alternative arts organization, has announced the dates for its Annual Art Auction Exhibition and Gala, SELECT. The curated exhibition will be on view Saturday, February 19 through Saturday, March 12, 2011. Saturday, March 12, 2011 marks the 30th anniversary of the organization's well-known arts gala that includes a curated silent auction of more than 100 contemporary works by top contemporary artists, formal dinner, and performance art. Tickets to the auction gala start at $300. I have been selected to participate in this auction for the second year in a row. The event will be held at 700 Sixth Street, an Akridge-managed property, in northwest Washington; it is expected to draw over 500 art enthusiasts. In advance of the March 12 event, WPA will host an exhibition opening reception on February 19 from 6:00 to 9:00 pm and Curators' View on March 1 from 6:30 pm to 9:00 pm. These two events are free and open to the public. At the Curators' View, each Select curator will present and discuss their exhibition selections. In addition, WPA's prized Alice Denney Award will be presented by Robert Lehrman to Washington-based artist William Christenberry for his support of WPA and sustained commitment to the DC arts community. The SELECT exhibition will be on view 11:00 am to 6:00 pm, Wednesdays-Saturdays, through March 12th. For a complete list of participating artists or images, please contact Kristen DeMarco at auction@wpadc.org. 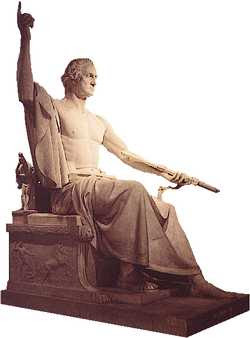 To commemorate the centennial of Washington's birth in 1832, Congress commissioned Greenough to create a statue to be displayed in the Capitol Rotunda. As soon as the marble statue arrived in the capital city in 1841, however, it attracted controversy and criticism. Greenough had modeled his figure of Washington on a classical Greek statue of Zeus, but many Americans found the sight of a half-naked Washington offensive, even comical. After the statue was relocated to the east lawn of the Capitol in 1843, some joked that Washington was desperately reaching for his clothes, on exhibit at the Patent Office several blocks to the north. In 1908 Greenough's statue finally came in from the cold: Congress transferred it to the Smithsonian. It remained at the Castle until 1964, when it was moved to the new Museum of History and Technology (now the National Museum of American History). The marble Washington has held court on the second floor ever since.